Powers/Abilities/Functions: The explorer chair had tank tread wheels to help it cover difficult terrain. It could be fitted with steel cables in order to lower it into deep caverns. Hydralic extendo-arms were built into each side of the chair and could be released to help support the chair, and climb across pits. History: (X-Men I#8) - Professor X used his explorer chair to lower himself into the caverns of Lucifer's base in the Balkans, keeping in touch with Cyclops telepathically as he descended. (X-Men I#9) - After reaching the bottom of the cavern, Xavier gave his location to the X-Men, then set out to find Lucifer. 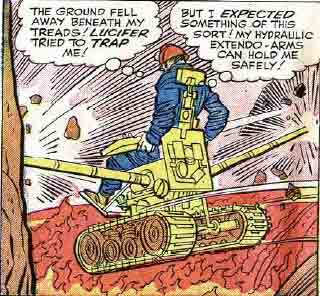 Lucifer activated a trap that caused the ground beneath Xavier to crumble away, but the chair's hydraulic extendo-arms grabbed on to the sides of the cave walls, saving him. Lucifer generated an artificial dust devil and set it out to capture Xavier, forcibly taking him away from the chair. Comments: Created by Stan Lee, Jack Kirby and Chic Stone.